O n October 8, 1867 in Panora, Iowa, future Little Rock Mayor Warren E. Lenon was born. He was one of eleven children of John D. and Margaret M. Long Lenon. Lenon came to Little Rock in 1888 after finishing his schooling in Iowa. He helped set up an abstract company shortly after his arrival. In 1902 he organized the Peoples Savings Bank. Among his other business interests were the City Realty Company, the Factory Land Company, the Mountain Park Land Company, and the Pulaski Heights Land Company. 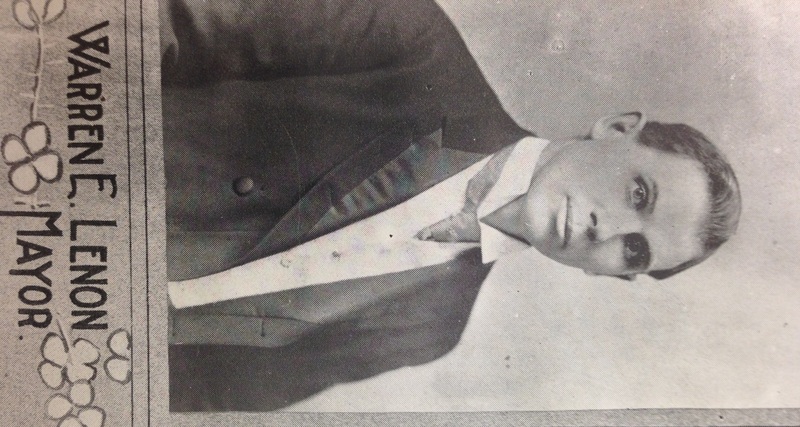 From 1895 to 1903, he was a Little Rock alderman, and in 1903, he was elected Mayor of the city. A progressive Mayor, he championed the construction of a new City Hall which opened in 1908. At the first meeting of the City Council in that building, Mayor Lenon tendered his resignation. His duties in his various business interests were taking up too much of his time. Mayor Lenon had been a champion for the establishment of a municipal auditorium. He had wanted to include one in the new City Hall complex. But a court deemed it not permissible under Arkansas finance laws at the time. He also worked to help establish the first Carnegie Library in Little Rock which opened in 1912. Mayor Lenon continued to serve in a variety of public capacities after leaving office. In the 1920s, he briefly chaired a public facilities board for an auditorium district. It appeared he would see his dream fulfilled of a municipal auditorium. Unfortunately the Arkansas Supreme Court declared the enabling legislation invalid. In 1889, he married Clara M. Mercer. The couple had three children, two of whom survived him: a son W. E. Lenon Jr., and a daughter Vivion Mercer Lenon Brewer. Together with Adolphine Fletcher Terry (also a daughter of a LR Mayor), Mrs. Brewer was a leader of the Women’s Emergency Committee. Mayor Lenon died June 25, 1946 and is buried at Roselawn Cemetery. Lenon Drive just off University Avenue is named after Mayor Lenon. Vivion Brewer, Adolphine Terry, and Pat House with an award presented to the WEC around the time the group disbanded. On Tuesday, September 16, 1958, the first meeting of the Women’s Emergency Committee to Open Our Schools took place at the Pike-Fletcher-Terry House in downtown Little Rock. Fifty-eight women were in attendance at the initial meeting. The group had been envisioned four days earlier, on September 12. At the time, Adolphine Fletcher Terry had invited Vivion Lenon Brewer and Velma Powell to her house to discuss the current school situation. Terry and Brewer were both daughters of former Little Rock mayors. They were frustrated with the stalemate that was taking place with the Little Rock School District, the State, and the Federal Government. The same day the trio met, an immediate concern superseded their general discontent. On September 12, Governor Faubus had signed several segregationist bills into law. One of them gave him the authority to temporarily close schools in order to keep the from being integrated. After signing the bills, he issued an order closing Little Rock’s four high schools. He set October 2 as the election day for Little Rock voters to ratify or reject the closing. The closure of the schools and impending election, gave an urgency and an immediate focus for the WEC. The women sprung into action. The way the election law was written, keeping the schools open would require a majority of all registered voters — not just those voting in the election. There were several other requirements written into the law that made it all but impossible to reject the closure. Nonetheless the WEC went to work. They wrote letters, made phone calls, made personal pleas, raised money, and placed newspaper ads. Their need for a quick and efficient organization became even more paramount with the Governor moved the election forward to September 27. His public reason was to remove the uncertainty; but privately he was likely concerned that there was organized opposition. Though the voters approved keeping the high schools closed, the WEC was undaunted. They continued to work throughout the 1958-59 school year in a variety of ways. They backed candidates in the December 1958 school board elections, and succeeded in getting three moderates elected. In May 1959, they were a crucial bloc in the campaign to recall of three segregationist school board members. Following the reopening of the schools in 1959, the WEC continued to focus on social issues until disbanding in 1963. The membership of the WEC was kept a secret. No official roll was kept. With a membership which swelled to over 1,300, obviously not all attended meetings at once. There were well organized phone trees which quickly got the word out to the membership. During elections, they would create files on all registered voters with codes for Saints, Sinners and Savable. In an effort of intimidation (as if anyone could intimidate Adolphine Fletcher Terry), there were efforts to force the WEC to disclose membership lists. The officers and their legal counsel replied that there were no lists in existence, so there was nothing to disclose. A ceremony at the house in October 1998 celebrated the 40th anniversary and the names permanently etched there. First Lady Hillary Rodham Clinton came back to Little Rock to deliver remarks at the ceremony. Sara Murphy, a member of the WEC wrote a book about the organization which was published in 1997, shortly after her death. Around the same time, Sandra Hubbard produced a documentary called The Giants Wore White Gloves. A sold out screening of the film is scheduled today at the CALS Ron Robinson Theatre as a presentation of the Clinton School Speaker Series in conjunction with the Butler Center for Arkansas Studies. In 1889, he married Clara M. Mercer. The couple had three children, two of whom survived him. A son W. E. Lenon Jr., and a daughter Vivian Mercer Lenon Brewer. Together with Adolphine Fletcher Terry (also a daughter of a LR Mayor), Mrs. Brewer was a leader of the Women’s Emergency Committee. Mayor Lenon with the plans for the original City Hall/Auditorium and the temporary auditorium. In 1904, Little Rock Mayor W. E. Lenon first proposed that Little Rock construct at municipal auditorium. After considering some options, he decided it would be easiest to build it in conjunction with a new City Hall and Jail. In 1906 plans proceeded in that direction until a lawsuit by J.N. Heiskell to stop it. Following a judge’s ruling that a municipal auditorium was not deemed a proper use for public monies, the City changed course and constructed only a City Hall and Jail (sans auditorium) at the corner of Markham and Broadway. This building opened in 1908. In 1906, the City gave permission to a private developer to build a temporary auditorium (which also served as a roller skating rink when the chairs were removed) adjacent to the City Hall site. This opened in 1907. Mayor Lenon left office in 1908. He would later chair a committee involved in an auditorium proposal in 1925, but that one would come to naught, as well. However, he planted the seed and started the public discourse which lasted for 36 years. 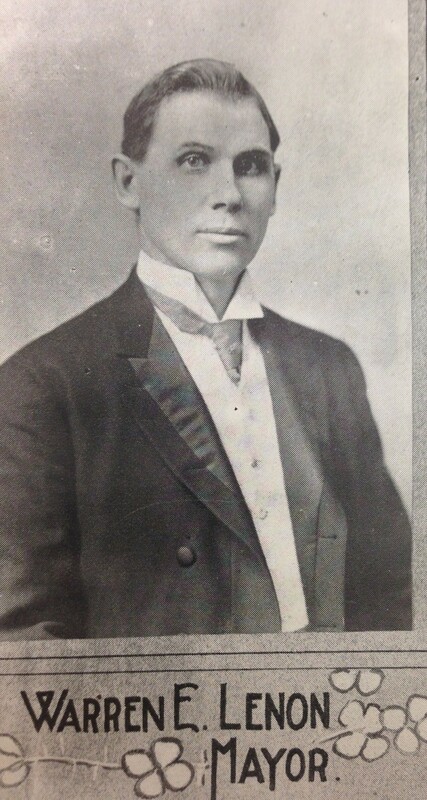 His daughter, Vivion, would be married to Joseph Brewer a nephew and aide of Joseph T. Robinson, after whom the eventual auditorium would be named. In 1889, he married Clara M. Mercer. The couple had three children, two of whom survived him. A son W. E. Lenon Jr., and a daughter Vivian Mercer Lenon Brewer. She was married to Joseph Brewer, a nephew of Joseph Taylor Robinson, after whom the City’s eventual municipal auditorium would be named. Mrs. Brewer was also a leader of the Women’s Emergency Committee. On October 8, 1867 in Panora, Iowa, future Little Rock Mayor Warren E. Lenon was born. He was one of eleven children of John D. and Margaret M. Long Lenon. In 1889, he married Clara M. Mercer. The couple had three children, two of whom survived him. A son W. E. Lenon Jr., and a daughter Vivian Mercer Lenon Brewer. She was married to Joseph Brewer, a nephew of Joseph Taylor Robinson, after whom the City’s eventual municipal auditorium would be named.